Last week, while driving past the West 4th Street exit on I-80, I saw a pair of Osprey perched near a large stick nest at the top of a telephone pole. Tuesday morning, I went down to take a closer look. 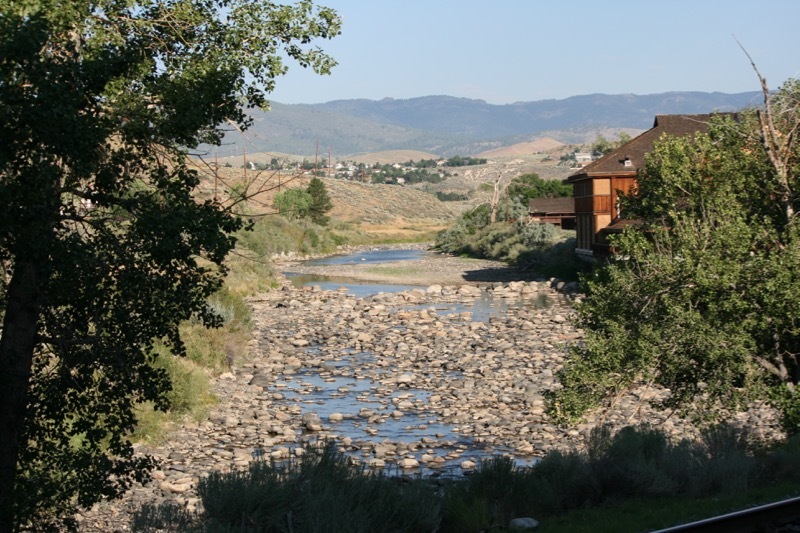 The nest is located close to the Truckee River and several Fremont cottonwood trees. Two adult Osprey were nearby, but one flew off downstream almost immediately after I arrived. Through binoculars, I watched the second adult as it perched on the nest, feeding bits of food to two big chicks. 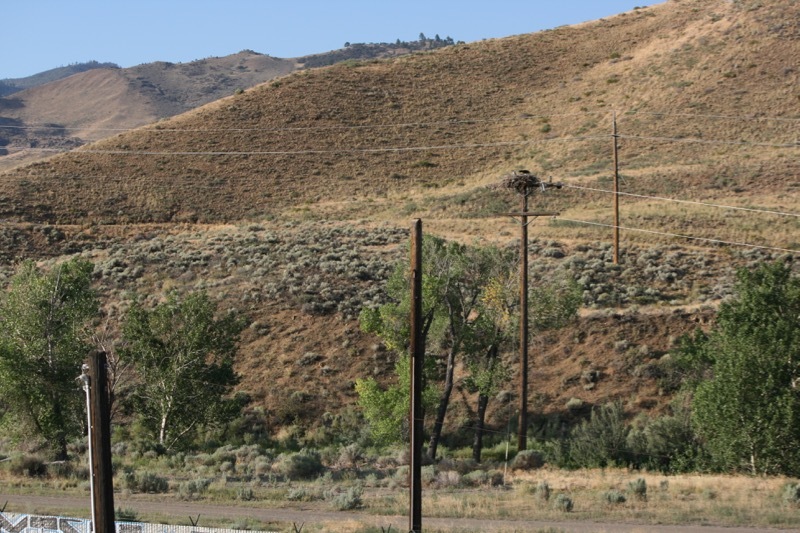 The Osprey nest on West 4th Street is close to the Truckee River and several cottonwood trees. July 21, 2015. Osprey feed on fish, and nest near water (close to fish). After hatching, the parents feed fish to the nestlings, which stay in the nest for approximately two months. The male will generally bring the fish to the nest, feeding himself first and then delivering the rest to the female. The female then tears off pieces of fish with her bill, and feeds it to the chicks, which is what was happening when I arrived. Twice, the female Osprey flew off and returned with sticks. 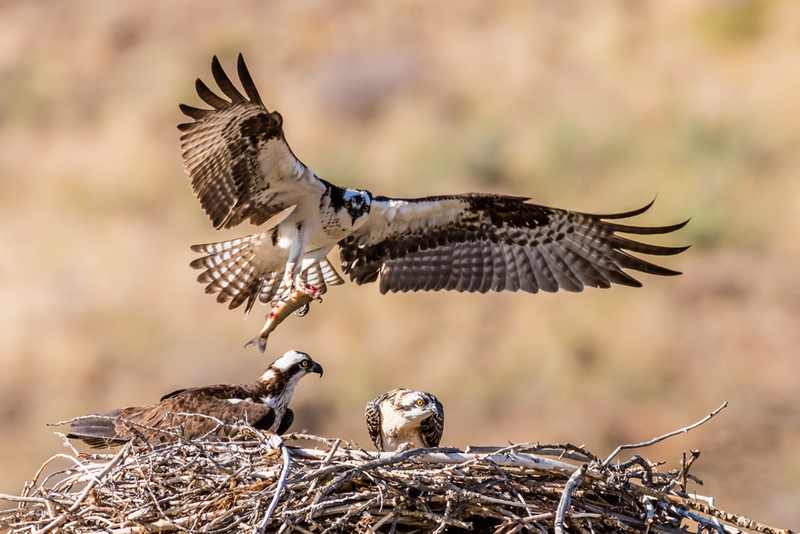 When building nests, the male Osprey generally brings sticks to the nest site, and the female Osprey arranges them. After the chicks hatch, and during the entire time that chicks are in the nest, the female often continues to add nest material — which can also include grass, plastic bags, bark, or pieces of algae. I was not the only one who had come down early to see the Osprey. Local photographer Jerry Fenwick was also out on the 4th street off-ramp, and shared some fantastic photographs! Osprey Landing with Fish, Reno, NV. July 21, 2015. Photo credit: Jerry Fenwick. 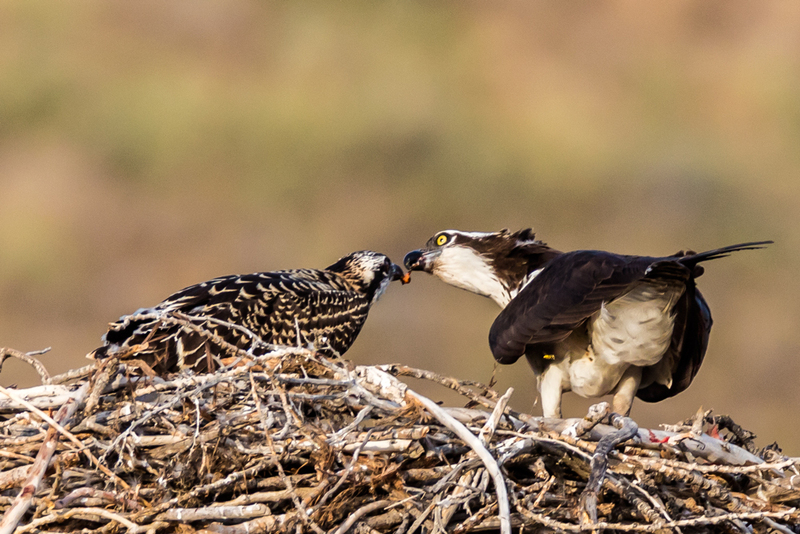 Female Osprey feeding chick, Reno, NV. July 21, 2015. Photo credit: Jerry Fenwick. 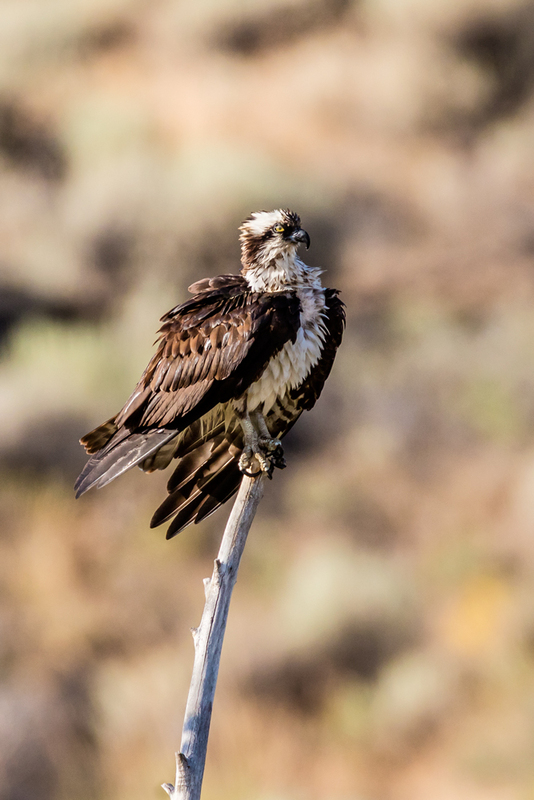 Female Osprey drying, after a bath in the Truckee River. July 21, 2015. Photo credit: Jerry Fenwick. A big thanks to Jerry Fenwick for sharing his photos! If you’d like to see the Osprey, drive out to the end of West 4th Street, and look for a large stick nest at the top of a telephone pole. Bring binoculars — you can’t get too close, because there are several fences and a set of train tracks between the road and the nest. It’s best not to disturb nesting birds, anyway. You can get the best view by walking down the off-ramp toward the highway, but be careful — a police officer stopped and warned us that we should wear bright colors because drivers might not be looking for birdwatchers. Low water probably makes for easy fishing for Osprey. Truckee River, West 4th Street, July 21, 2015. That is so special. I know right where that is, and haven’t lived in reno for 12 years. Thank you for sharing a little bit of the wild Reno I miss so much. My Bird Club is erecting an Osprey Nest Pole in our community is South Carolina. Along with the Nest Pole will be an information sign. I would very much like to use Jerry Fenwick’s photo “Osprey Landing with Fish” on the sign. How can I obtain permission to do so. Please let me know.